Leading coffee and baked goods giant, Dunkin’ Donuts, will be treating their customers across the world with a free donut for every beverage ordered, to celebrate World Donut Day on June 6. In recognition of the joy and happiness donuts bring to people around the world, guests at participating Dunkin’ Donuts outlets will be offered a free donut of their choice with every beverage purchased. This sweet treat will be available to Dunkin’ Donuts guests in 33 different countries across the globe including the UAE as part of the brand’s worldwide celebration of Donut Day. Dunkin' Donuts has been a leading provider of donuts for more than 60 years, selling approximately 2.4 billion donuts and munchkins worldwide last year. Dunkin’ Donuts restaurants around the world offer dozens upon dozens of different varieties of donuts, including global favourite flavors such as Boston Kreme, Glazed and Chocolate Frosted. Beginning with a single restaurant in Quincy, Massachusetts, the Dunkin’ Donuts story has been one of epic success. Over the years the international quick serve giant, part of the Dunkin’ Brands Group headquartered in Canton, Massachusetts, has captured the loyalty of a worldwide following and is today present in over 33 countries and operates nearly 11,000 restaurants worldwide. 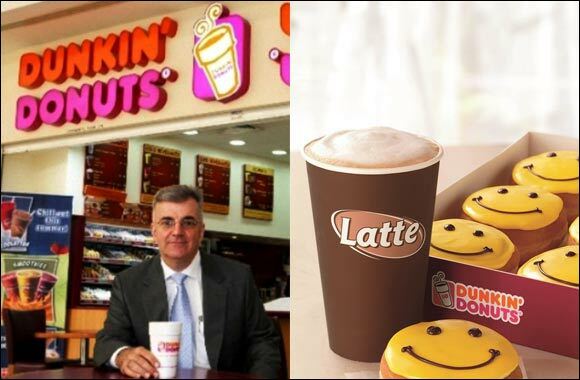 With 74 outlets across the UAE, Dunkin’ Donuts serves up a wide spectrum of popular products, including their wide variety of doughnuts, delicious hot and iced coffee, hot and iced lattes, cappuccinos, coolatta slush drinks, munchkins and other baked goods and beverages.